Submitted by IPSC on Tue, 17/08/2010 - 17:05. 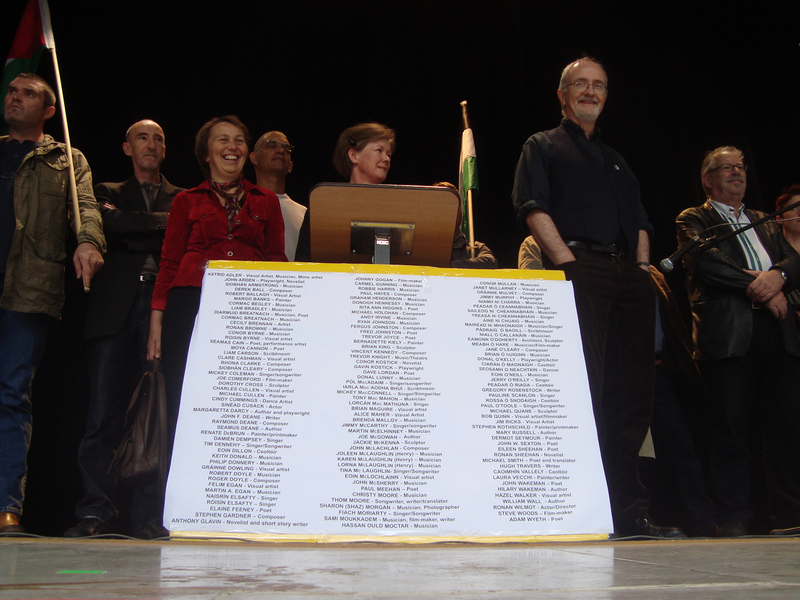 On the afternoon of Thursday 12th August 2010, the Ireland Palestine Solidarity Campaign (IPSC) officially launched the historic “Irish artists’ pledge to boycott Israel” at a lunchtime concert in Meeting House Square in Dublin. 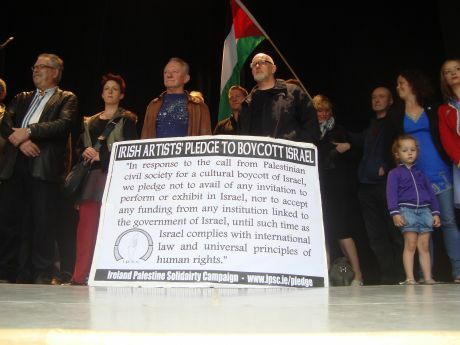 Present at the launch were 20 of the pledge’s current 150 signatories, including musicians Damien Dempsey, Donal Lunny and Eoin Dillon (Kíla), artists Robert Ballagh and Felim Egan, playwright Jimmy Murphy and actress Neilí Conroy as well as a crowd of supporters. 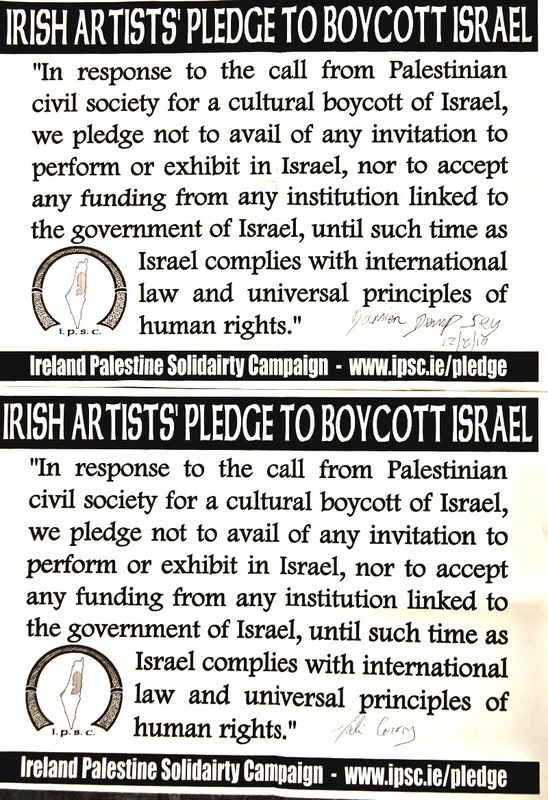 "In response to the call from Palestinian civil society for a cultural boycott of Israel, we pledge not to avail of any invitation to perform or exhibit in Israel, nor to accept any funding from any institution linked to the government of Israel, until such time as Israel complies with international law and universal principles of human rights." 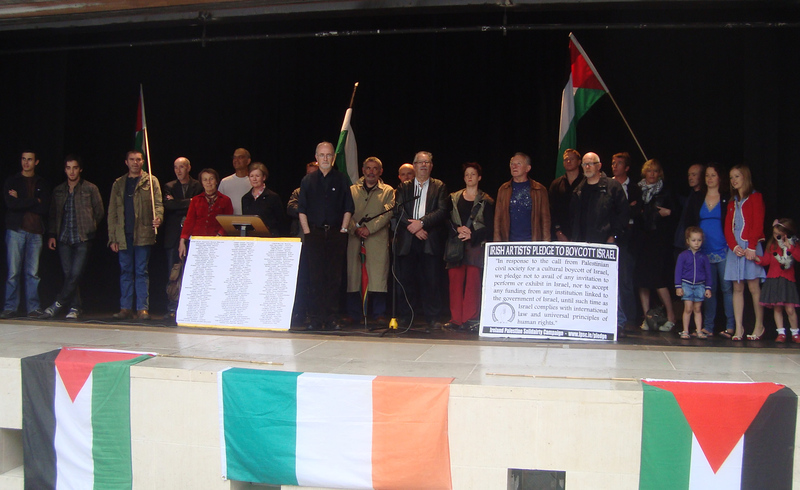 Speaking about his support for the pledge, Kíla’s uilleann piper Eoin Dillon who, along with jazz guitarist Sami Moukaddem, played his brand new song Rachel Corrie, said: “I encourage all Irish artists to take this pledge and thereby honour not only their own dignity but more importantly, the dignity of the Palestinian people.” Eoin's brother Shane was kidnapped by Israeli commandos on May 31st this year when he was first mate on board the Challenger 1 which was part of the Gaza Freedom Flotilla. The concert also saw performances by Sami Moukaddem, Naisrín and Zahrah Elsafty (who preformed the Palestinian song La Ahada Yalem), and Treasa Ní Cheannabháin who along with her daughters performed her own song An dTiocfása Liomsa (Amhrán Ghaza).